Public and private retirement funds represent a considerable source of capital in the United States’ financial markets. In 2007, retirement plans held close to $9 trillion in assets. Such retirement plans encompass traditional pension plans, also called defined benefit (DB) plans, where assets are invested and managed on a group basis, and defined contribution (DC) plans, where individuals typically direct investments on their own. This Issue Brief examines how these plans invest their assets and how these investments have changed over time. 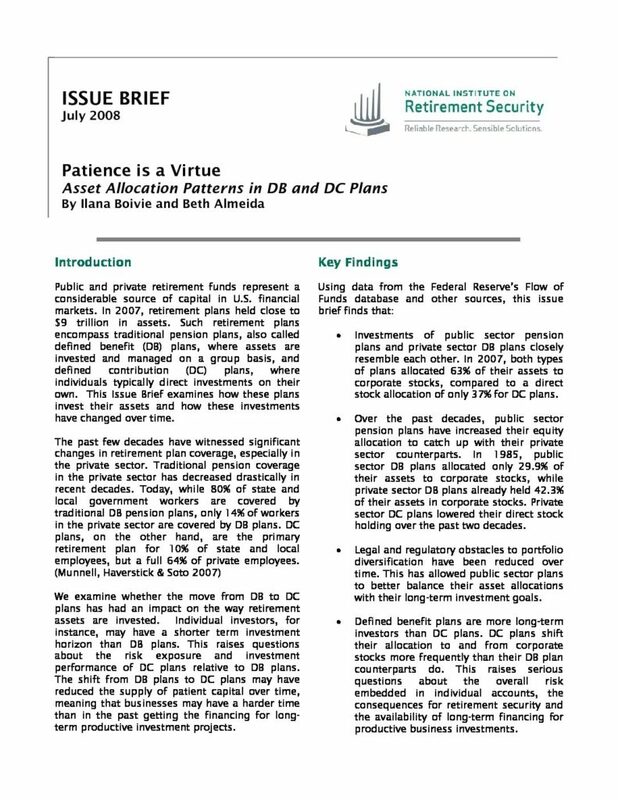 We examine whether the move from DB to DC plans has had an impact on the way retirement assets are invested. Individual investors, for instance, may have a shorter term investment horizon than DB plans. This raises questions about the risk exposure and investment performance of DC plans relative to DB plans. The shift from DB plans to DC plans may have reduced the supply of patient capital over time, meaning that businesses may have a harder time than in the past getting the financing for long-term productive investment projects.